The current exhibit at the Karpeles Manuscript Library Museum contains personal letters and confessions written by Al Capone, Ghandi, Lee Harvey Oswald, Mata Hari and Mary Queen of Scotts. Charles Manson's letter on notebook paper is one of the most interesting, if just for its biohazard possibilities. Letters from the Pen will be up through June 30, 2008. I wish that they would have just executed this POS, they might get their chance if they find more bodies out there and prosecute him for those murders as well. jcoltf -- interesting thought. Have you been to see any of the documents, yet? Unfortunately I am living in South Texas but I will be comming in for a visit soon, I am well over due. 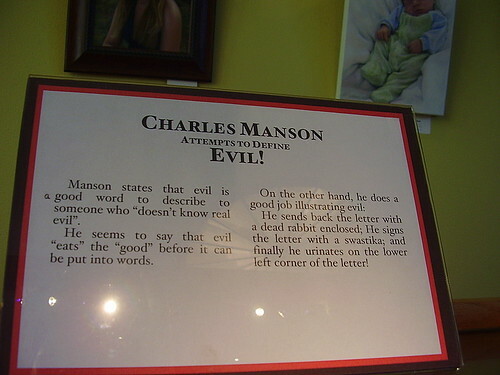 Just think of how much more value would be added to these documents if they were written by "the late" Charles Manson. I saw the Manson pee! Of note: I hear that R. Giulliani spoke out against this exhibition in NY...he's SOOO anti-pee.